Trailer for Post-Apocalyptic Creature Feature HOSTILE! 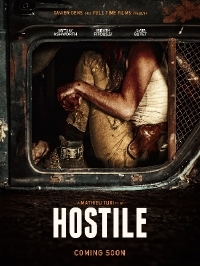 Bloody Disgusting have premiered the first trailer for Mathieu Turi's hotly anticipated post-apocalyptic thriller, Hostile! The movie, produced by famed French extremist Xavier Gens (The Divide, Frontier(s)) stars Brittany Ashworth (The Crucifixion), Gregory Fitoussi (World War Z, GI:JOE) and Javier Botet (Rec, Crimson Peak). Hostile has been raking in the accolades at festivals recently, winning a bunch of awards including "Best Foreign Film" and "Best Makeup FX" at FilmQuest. It will screen at the prestigious SITGES International Film Festival next week, Oct. 10 & 11. After a worldwide epidemic, most of the planet's population is killed. Only a few thousand have survived and are struggling to find food and shelter. But they're not alone: they have to hide from strange creatures that go hunting at night. Juliette, a young woman whose life has taught her to handle things on her own, is the only one in her group to have the guts to go anywhere near cities to find food. But, on her way back to the camp one afternoon, she loses control as she's driving and wakes up upside down, stuck in her car with a broken leg, in the middle of the desert and it's... nighttime.